Glamping or camping in style!! Coconutz has beautifully appointed Eco Tents with all the mod cons and finishing touches. Coconutz is a short walk (approx 800 metres) to a tidal lagoon and our beautiful secluded part of Cable Beach. Each eco tent fully is self contained with own ensuite, outdoor kitchen and dining area with fridge and bbq. An additional outdoor bathroom with a gorgeous stone bath is perfect to relax in whilst stargazing. A maximum of 2 foldaway beds can be added to each eco tent at an additional cost. 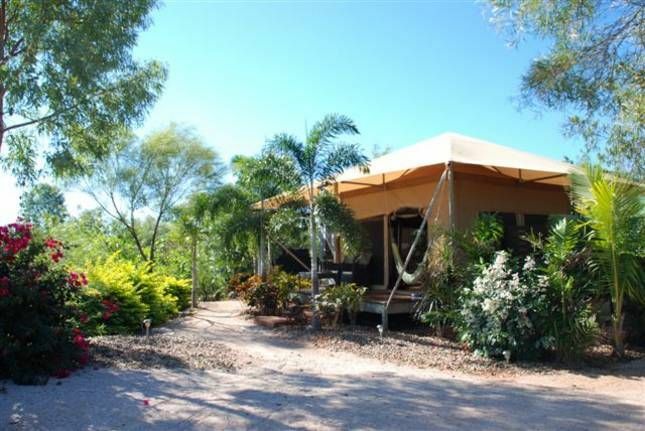 Coconutz is situated an easy 15-20 drive from Broome town centre (4WD not necessary but can be advantage for beach access). Short 800 metre walk to Coconut Well Beach. Secluded and safe with lovely reef at low tide to fossick around and great swimming beach at high tide. Outdoor dining area equipped with bbq and fridge. Lisa was the best host we have ever had -friendly, welcoming and accommodating. The tent was lovely and clean and the breakfast provided was more than substantial - eggs, yoghurt, milk, tea/coffee etc. We went up to the pool for sunsets and Lisa came out and had a chat and made sure we had everything we needed. She made us feel like we were in heaven! Will 100% be back here ASAP and cannot recommend highly enough for the most relaxing and enjoyable stay. Glamping at its finest. An amazing perch from which to spring down to the pristine beach. Lisa and Jason offer the finest of ‘glamping’ experiences within a stone’s throw away from the most pristine beach and waters that WA and Australia has to offer. Lisa has impeccably organized everything from cooking utensils to essential bedding and sheets. The bathtub outdoors in a Grand Design’s dream fantasy turned into a reality in this most idyllic slice of land. Guests have access to the pool next to Lisa Jason’s house on the hill, which is just perfect for viewing the coastline and aquamarine waters, Australian bush and birds of prey. I should like to highly recommend Lisa and Jason’s place for those seeking a tranquil spot near the beach, a fire pit to snuggle up next to or an amazing bbq underneath a glittering array of stars. Outstanding home stay and welcoming family nurtures the land and properties there. Throw yourself out there. This property is perfect...the surrounding garden is beautifully maintained, it is quiet and located in an idyllic location. It is handy to Broome but far enough away to escape the tourist mob! The friendly hosts are great as is the "Sunset Platter"; well worth ordering. An absolutely exquisite place to stay and relax. Lisa and Jason provide private and faultless accommodation. We will return as soon as we are able to and stay much longer than 2 nights.